Chris is a true pro. He created recessed built-ins in our kitchen fro spices and cookware. 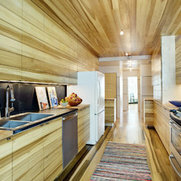 He also built cabinets to match existing cabinetry from the 1940s. Chris thought of every angle (like to have us estimate and measure our baking dishes and cookie sheets) and made sure he was building what we wanted. He also was incredibly fast. He took care of two recessed built-ins and a fabrication in three days. Finally, Chris is completely trustworthy. The project cost was exactly what he said it would be.